Lawmakers announced Thursday that they have reached an agreement that would avoid a government shutdown at the end of the month. Absent any action, current funding would expire Sept. 30 and agencies would be forced to close their doors. 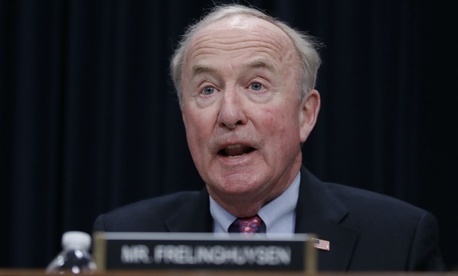 At a conference committee meeting on Thursday, Rep. Rodney Frelinghuysen, R-N.J., chairman of the House Appropriations Committee, said lawmakers would push that timeframe back until at least Dec. 7 with a continuing resolution. The continuing resolution is expected to get tacked onto a second minibus, containing full-year funding for the departments of Defense, Labor, and Health and Human Services. That package is currently working its way through conference committee after the House and Senate each passed their own versions, and congressional negotiators said they had struck an agreement to resolve the differences. It is expected to receive a vote on the Senate floor next week, an appropriations aide told Government Executive, and the House will likely follow suit the following week after it returns from recess. Lawmakers have kicked off the conference process on a third minibus, covering the departments of Interior, Treasury, Transportation, and Housing and Urban Development, as well the Environmental Protection Agency, Office of Personnel Management and General Services Administration, among others. But the appropriations aide said the two chambers are still far apart on that measure and they are unlikely to vote on a compromise prior to Sept. 30. The stopgap funding provision will cover whichever agencies lawmakers do not fund on annual basis prior to the end-of-September deadline. The CR will continue funding at fiscal 2018 levels aside from a few “minor, technical adjustments,” Frelinghuysen said. Trump has hinted at possibly vetoing any spending bill that does not fully fund his proposed wall along the U.S.-Mexico border, but has alternatively suggested he would push off that fight until after the upcoming midterm elections.